"No effects on human health have been shown as a result of the consumption of GM foods by the general population in the countries where they have been approved. "Decisions on the future of our food and agriculture should not be based on misleading and misrepresentative claims that a “scientific consensus” exists on GMO safety. In the three decades since the introduction of GMO crops, there have been more than 2,000 studies evaluating health and environmental aspects of genetically engineered products. The vast majority of studies has found nothing to indicate that GM foods represent a health threat. The consensus among scientists is that gene altered crops offer no more risk than those developed through conventional breeding techniques. Not one mainstream independent science or health organization has expressed unique concerns with GM foods. A small number of scientists and many anti-GMO activists dispute the notion of a scientific consensus, arguing that many safety studies were conducted by industry scientists, some studies point to potential health or safety problems and future risks remain unknown. …the scarcity and contradictory nature of the scientific evidence published to date prevents conclusive claims of safety, or of lack of safety, of GMOs. Claims of consensus on the safety of GMOs are not supported by an objective analysis of the refereed literature. It’s a position often repeated by some advocacy groups and journalists. 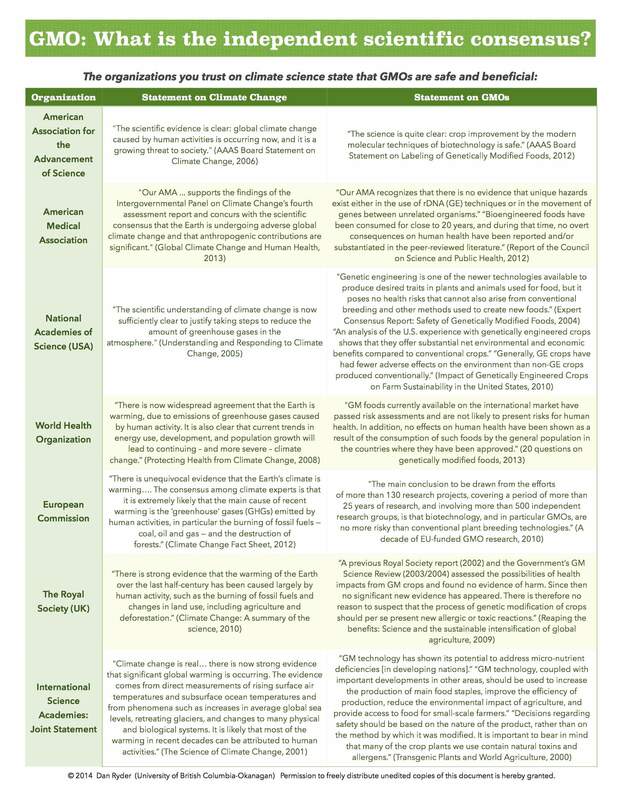 The main conclusion to be drawn from the efforts of more than 130 research projects, covering a period of more than 25 years of research, and involving more than 500 independent research groups, is that biotechnology, and in particular GMOs, are no more risky than conventional plant breeding technologies. Humans are only part of the safety equation, however, when evaluating the safety of agricultural products. 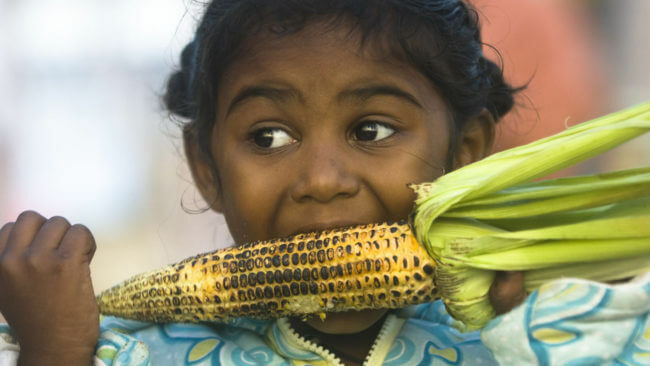 A sizable percentage of GM crops are used in animal feed. Europe, which tightly restricts GMO cultivation, is the world’s largest regional importer of GM grain. A November 2014 study by University of California-Davis animal geneticist Alison Van Eenennaam and assistant Amy Young examined 29 years of livestock productivity and health data. The period covered animals before and after the introduction of GMO animal feed in 1996. Today, these animals consume 70-90% of the world’s genetically engineered crops. In the US alone, animal agriculture produces over 9 billion food-producing animals annually, and more than 95% of these animals consume feed containing GE ingredients. The researchers found no evidence that GMO animal feed has had a negative impact on livestock. An extensive search of peer-reviewed literature and field observations of animals fed diets containing GE crop products have revealed no unexpected perturbations or disturbing trends in animal performance or health indicators. Likewise, it is not possible to distinguish any differences in the nutritional profile of animal products following consumption of GE feed. It’s estimated that many trillions of animals have consumed GM feed since their introduction. If GE feed is causing unusual problems, dead and sick animals would litter farms around the world. Yet there are no anecdotal reports of mass or even isolated health animal problems. No human health problem of any kind has yet been linked to the consumption of GM foods. A 2015 PEW survey of the world’s largest independent scientist group, the American Association for the Advancement of Science, found 88% view GM foods as safe—a stronger consensus than believe humans are a driving factor in global warming. Bolstered by both humans and animal studies, more than 275 science and health organizations have issued statements that GMOs present no unique health or safety challenges. Among them: National Academy of Sciences (USA), American Medical Association, Health Canada, Food Standards Australia New Zealand, British Medical Association and the French Academy of Sciences. 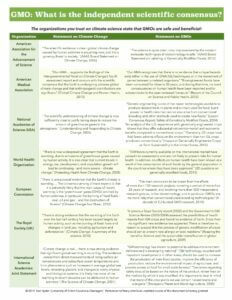 Many of the same groups have issued consensus statements on both climate change and GMO safety. Whether to continue and expand the introduction of GM crops and foods into the human food and animal feed supply, and whether the identified risks are acceptable or not, are decisions that involve socioeconomic considerations beyond the scope of a narrow scientific debate and the currently unresolved biosafety research agendas. These decisions must therefore involve the broader society. There have been some studies, widely reviewed and rejected by international regulatory and science organizations, suggesting that GMOs are responsible for, or could lead to, a variety of illnesses. The most oft cited is the 2012 study published in Food and Chemical Toxicology by French biologist Gilles-Éric Séralini, who claimed that rats fed genetically engineered corn and/or the herbicide glyphosate, which is often paired with the GMO crop, developed grotesque cancerous tumors. 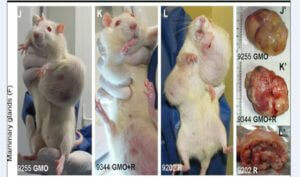 Pictured are rats that developed tumors during controversial testing by French biologist Gilles-Eric Seralini. The work was retracted after criticism from scientists and oversight bodies that the study used cancer-prone rats, controls were shoddy and data cherry-picked (e.g. data showed some rats fed glyphosate actually had few tumors, which the authors did not acknowledge in their commentary). Séralini and anti-GMO groups claimed the retracing journal bowed to industry pressure. The study was republished, without peer review, in Environmental Sciences Europe, a low impact journal (bottom ten percent of all environmental sciences journals), to much criticism. GMO critics cite other studies—almost all in low impact or what are known as predatory, pay-for-play journals—many of which are prominently displayed on anti-biotechnology websites, such as Collective Evolution—10 Scientific Studies Proving GMOs Can Be Harmful. 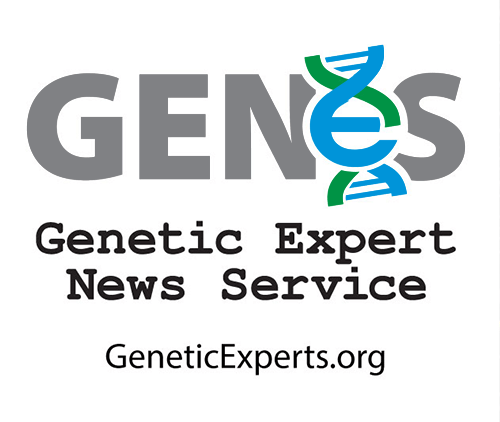 Mainstream scientists have responded (see fore example 10 studies proving GMOs are harmful? Not if science matters by molecular geneticist Layla Katiraee). There are also claims, often accompanied by correlation charts, that GMOs have caused an increase in allergies or cancers, issues evaluated in detail by the National Academies report. It concluded that there is no evidence that GMOs have caused increases in cancer, obesity, gastrointestinal illnesses, kidney disease, autism or allergies. Skeptics of GMO foods, such as the Union of Concerned Scientists (UCS), base their criticisms in part on the precautionary principle —“not enough is known” about the long term effects, they say. Many activists claim there have been no long-term studies other than the Séralini study, but that is not accurate. There have been dozens of multigenerational and long-term GMO studies on animals. Other critics suggest GMOs should not be banned until human studies have been conducted–which scientists say could not be done and would be unethical. Critics, like UCS, also say GMO research has been “tightly controlled by the industry”— a concern echoed in a 2009 Scientific American blog still widely circulated among activists. Scientists say GMO companies did restrict seed availability for studies years ago, but that problem no longer exists—as evidenced in part by the accessibility and use of patented seeds in studies by GMO-critical scientists. Many studies are industry funded by design—companies submit safety data as part of the regulatory process. But there are also studies, including hundreds funded by the European Commission, with no industry links. The independent website Biology Fortified lists more than 1000 studies in its database–more than one-third of which were independently funded. 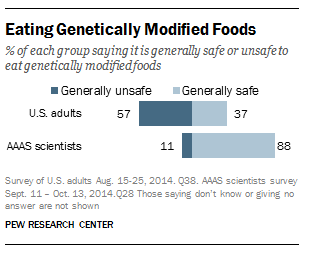 There also have been questions about whether GMOs represent a threat to people with allergies. It’s a relevant question when you consider that much of GMO technology to date has involved the mixing of genetic material from unrelated organisms, creating the potential for a new food item to produce allergens. Every unique GMO food is tested at the the Allergen Online database at the University of Nebraska, Lincoln, which is used by GM developers, the food industry and regulatory agencies for evaluating the potential allergenicity of novel proteins and GMOs. The database is independently managed by internationally recognized allergy experts who review and vote on allergen inclusion in a yearly process. Such testing proved essential in the mid 1990s when a soybean that contained genetic material from the Brazil nut was developed. The transgenic soybean produced proteins that could be dangerous to people with sensitivity to Brazil nuts. Pioneer Hi-Bred International had planned to market the soybeans as animal feed, but terminated the project over concerns that those soybeans might accidentally find their way into the human food supply. Critics cite this as a warning flag; GMO supporters cite it as support for its belief that the ‘system works’. THIS is why scientists stress the number of studies that have examined genetically engineered crops. THIS is why scientists stress the statements made by reputable scientific institutions about GMOs. THIS is why meta-analyses and literature reviews are important. Because no single study proves safety: it’s the sum of the studies, the body of data, the totality of research that’s been done which suggests that the current GMOs on the market are safe relative to their conventionally bred counter-parts. By examining the body of data, scientists develop a consensus: the overwhelming majority of mainstream working scientists in the relevant field stop debating an issue because the direction that the evidence points has become clear. Although there are many matters on which a clear consensus has not yet emerged, on the topic of genetically engineered crops the consensus is that the current crops on the market place pose no greater risk to health than their non-GMO counterparts.